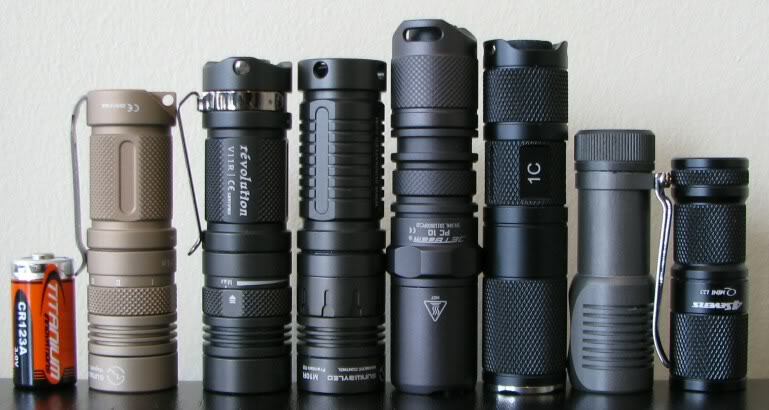 From left to right: CR123A; Sunwayman M11R, V11R, M10R; JetBeam PC10; Thrunite Neutron 1C; Zebralight SC30; 4Sevens Mini 123. When most people talk about their warm tints, they actually mean neutral according to the manufacturer (around 4000-4500K CCT). We just call them warm by habit because they’re warmer than the cool tints. There are even warmer tints as well, though IMO those go too far in the other direction. Your typical white LED is actually a blue LED covered in yellow-green phosphor. It has gaps in the colour spectrum it emits and an uneven distribution overall. This causes colours to appear unnatural under the light and makes it more difficult to distinguish boundaries and colours than it would be under sunlight. For cool white there’s a gigantic spike at blue, a gap at cyan, and then a spike at yellow-green with a rapid falloff to a gap towards red. Neutral white slops on more phosphor to convert more of the blue, which reduces efficiency but gives better red coverage. Reds and browns are very common in nature so the colour distribution of warmer tints can be more useful than getting fractionally more lumens from using a cool tint. Especially outdoors. Increasing red light and reducing blue also has the added benefit of cutting through fog and smoke better, since blue tends to scatter easily. TaxAct – easy to use but charges you to see your history. Make sure to save your files. EFTPS: The Electronic Federal Tax Payment System – Pay online straight to the gov. Commercial parties can get you in trouble if they screw up. United Kingdom’s National Institute for Health and Clinical Excellence (NICE), a rationing system that controls government costs. NICE’s denial of care is legendary — from the arthritis drug Abatacept to the lung cancer drug Tarceva. These drugs are effective. It’s just that the bureaucrats don’t consider them cost effective. Want a preview of ObamaCare in action? Check out the Massachusetts insurance market—which earlier this week entered a state of “market chaos” after Governor Deval Patrick denied a host of health insurance rate increases. Costs have exploded, requiring additional tax hikes and the entire system is only possible due to sizable transfers from the federal government. The plans are so unaffordable that in 2007, 62,000 people were exempted from the individual mandate. So much for universal coverage. The only way the Massachusetts plan will survive is with continued and increasing federal subsidies — that is, tax revenue from the residents of other states. PHOTO ESSAY: A world without nuclear weapons. You are currently browsing the Wacki's blog blog archives for April, 2010.